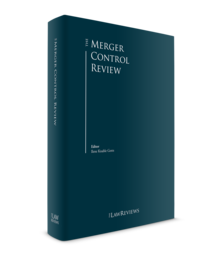 Merger control in Switzerland is governed by the Federal Act on Cartels and Other Restrictions of Competition (ACart) and the Merger Control Ordinance (MCO). These competition regulations came into force on 1 July 1996 and were first revised in 2003. Concentrations are assessed by the Competition Commission,2 an independent federal authority based in Bern that consists of up to 15 members. There are currently 12 members who were nominated by the federal government, the majority of which are independent experts (i.e., law and economics professors). Deputies of business associations and consumer organisations take the other seats. Cases are prepared and processed by the Secretariat of the Competition Commission (with a staff of 72 employees at the end of 2017 (full-time and part-time), mostly lawyers and economists), divided into four departments: product markets, services, infrastructure and construction. The types of transactions that are subject to merger control are mergers of previously independent undertakings; and direct or indirect acquisitions of control by one or more undertakings over one or more previously independent undertakings, or parts thereof. Joint ventures are also subject to merger control if the joint venture company exercises all the functions of an independent business entity on a lasting basis; if a joint venture company is newly established, it is subject to merger control if, in addition to the above criteria, the business activities of at least one of the controlling shareholders are transferred to it. These thresholds are considered to be relatively high in comparison with international standards. Alternatively, a particularity of the Swiss regime is that if the Competition Commission has previously issued a legally binding decision stating that an undertaking holds a dominant position in a particular market, such undertaking will have to notify all its concentrations, regardless of the turnover thresholds, provided that the concentration concerns that particular market or an upstream, downstream or neighbouring market. According to Article 4(2) ACart, an undertaking is considered to hold a dominant position if it is 'able, as regards supply and demand, to behave in a substantially independent manner with regard to the other participants in the market (competitors, suppliers, buyers)'. If the thresholds are met, or in the case of a dominant undertaking as explained above, the concentration must be notified to the Competition Commission prior to its completion. If a transaction is implemented without notification or before clearance by the Competition Commission (or if the remedies imposed are not fulfilled), the companies involved may be fined up to 1 million Swiss francs. Members of the management may also be fined up to 20,000 Swiss francs. So far, the Competition Commission has imposed several fines on companies for failure to notify, but there has been no criminal sanction of members of management. Furthermore, the Competition Commission may order the parties to reinstate effective competition by, for instance, unwinding the transaction. The ACart does not stipulate any exemptions to the notification requirements. However, if the Competition Commission has prohibited a concentration, the parties may in exceptional cases seek approval from the federal government if it can be demonstrated that the concentration is necessary for compelling public interest reasons. Such approval has, however, not been granted so far. Specific rules apply to certain sectors. Thus, a concentration in the banking sector may be subject to a review by the Swiss Financial Market Supervisory Authority, which may take over a case involving banking institutions subject to the Federal Law on Banks and Saving Banks, and authorise or refuse a concentration for reasons of creditor protection, irrespective of the competition issues. If the parties involved in a concentration hold special concessions (e.g., radio, television, telecommunications, rail, air transport), a special authorisation by the sector-specific regulator may be required. Moreover, under the Federal Law on the Acquisition of Real Estate by Foreign Persons, for any concentration involving a foreign undertaking and a Swiss real estate company holding a portfolio of residential properties in Switzerland, the approval of the competent cantonal or local authorities may also be necessary. causes harmful effects that cannot be outweighed by any improvement in competition in another market. In two decisions issued in 2007, Swissgrid and Berner Zeitung AG/20 Minuten (Schweiz) AG, the Swiss Supreme Court had to determine whether a concentration could be prohibited if there was a mere creation or strengthening of a dominant position or whether conditions (a) and (b) (i.e., creation or strengthening of a dominant position and elimination of effective competition) were cumulative. This question has significant practical consequences, because if the two conditions are cumulative, then a concentration must be authorised even if a dominant position is created or strengthened if it cannot be established that the concentration will eliminate effective competition. In the Swissgrid case, seven Swiss electricity companies wanted to integrate their electricity-carrying network under a common company. The Swiss Supreme Court held that conditions (a) and (b) were cumulative. The reasoning followed by the Supreme Court was that merger control is part of the control of market structure. Therefore, to justify an administrative intervention, the concentration must result in a concrete negative change in the market structure and the competition must be altered. In this case, the Court found that competition did not exist prior to the concentration. Accordingly, the concentration would not change the market conditions and the administrative intervention was not justified. In more recent cases (notably the Tamedia/PPSR (Edipresse) case), the Competition Commission examined whether the concentration could eliminate effective competition, but in a way that might indicate that it is in fact reluctant to give an autonomous scope to that criterion. In practice, the efficiency gains provided in condition (c) have so far played no role. 2018 opened with the changing of the guard at the Competition Commission. Vincent Martinet, who had been leading the efforts of the federal enforcer since 2010, stepped down after 12 years of service with the Commission. He handed over the baton to Andreas Heinemann, his former deputy for the past six years. In 2017, there was an increase in the number of notifications of company mergers, with 32 reports (in contrast to 22 the previous year), reflecting increasing M&A activity. Twenty-seven cases were cleared after a preliminary investigation (Phase I). Three in-depth investigations (Phase II) were launched. Considering the substantive test applicable to Swiss merger control (see Section I above), in the past, the Competition Commission prohibited only two concentrations back in 2004 and 2010, namely the acquisition of (joint) control of Berner Zeitung over free newspaper 20 Minuten (the prohibition had been overturned on appeal) and the intended takeover of telecommunication company Sunrise by competitor Orange (now Salt). In 2017, the Commission vetoed a deal for the third time in its history. In the spotlight was the acquisition of a joint control by Ticketcorner Holding AG and Tamedia AG over Ticketcorner AG and, indirectly (as a 100 per cent subsidiary of Ticketcorner AG post-transaction), Starticket (a subsidiary of Tamedia). In addition to being the two most popular brokers for the sale of show tickets online and offline to audiences across Switzerland, both Ticketcorner and Starticket provide marketing services to promoters in the show business via advertising campaigns in the media and social networks and by giving promoters access to a software allowing them to do direct sales. While the Competition Commission's detailed review of the deal revealed no threats to the markets for direct sales, it provided enough evidence to show the already dominant position of Ticketcorner in the market for primary ticketing. The Commission determined that the merger would give the two companies unchallenged control over that market in Switzerland. The Commission's ban was prompted by an in-depth analysis of both companies already present in the market and potential entries of future competitors, as well as market trends and the increasing clout of global players such as Spotify, Facebook and Google. The Commission concluded that, in spite of clear technological advances, the newly merged companies could still easily withstand behavioural pressure from competitors and thus refused to grant approval. The decision has been challenged by Ticketcorner in the Federal Administrative Court. Another merger received a great deal of publicity, involving in-patient hospital services: On 18 September 2017, the Competition Commission approved the planned merger between the University Hospital of Basel and the Cantonal Hospital of Baselland resulting in the creation of a joint hospital group. At the outset, the Competition Commission dealt quite extensively with the material scope of the ACart and its applicability in the healthcare sector. It considered that all activities of the concerned hospitals fall under the ACart, except for the creation of hospital lists as well as the control of the SwissDRG and TARMED. While the Commission determined that the newly created hospital group may attain an important competitive edge in the market for acute in-patient services in the Basel area, the enforcer failed short of proving that the merger would create a dominant position liable to eliminate effective competition in that region. Thus, lacking the necessary statutory requirements, the Commission could not intervene – the planned merger received a green light. The Competition Commission also had the opportunity to provide useful clarification in relation to undertakings in the financial sector willing to create a full-function joint venture structured under French law, the purpose of which was to set up and provide SMEs a post-trade blockchain infrastructure for securities on Euronext markets. The parent companies planned to invest in the joint venture but would not transfer any commercial activity, assets, know-how or human capital to the said joint venture. As a matter of principle, such transaction would fall under Swiss merger control. However, since the capital injected by the parent companies was not intended to be used as a means for commercial activities but rather to help set up an independent entity and an IT solution, the Competition Commission considered that the transaction was not subject to Swiss merger control. Several other green lights were granted by the Commission across a variety of sectors in the course of 2017. In the telecommunications sector, after a preliminary examination, the Commission allowed the entry of BuyIn SA as an autonomous entity into the market. BuyIn SA had been set up in 2011 as a non-full function joint venture between German Telecom AG and Orange SA. A similar outcome was enjoyed by two notable mergers in the media and advertising sector, as Tamedia received the coveted 'go-ahead' of the Commission on the account of acquiring exclusive controls both over Tradono Switzerland, active in the market for small ad apps, and over Neo Advertising, operating in the field of outdoor communications. In the energy sector, a couple of mergers successfully underwent the scrutiny of the Swiss federal competition authorities. Among those, the joint venture between Energiedienst Holding AG, Hälg & Co AG and Inretis Beteiligungen AG aiming to provide solutions to network energy systems architecture. The other notable case that received the Commission's approval was the acquisition of joint control by Electricité de France (EDF) and Caisse des dépôts et consignations (CDU) of the Reseau de transport d'électricité (RTE), previously under EDF's exclusive control. Other sectors across the industry, including transportation, digital security, IT and data protection, have also kept the Commission busy over concentration notices, all of which eventually received a green light. In the container shipping industry, it was the takeover of the Hamburg Südamerikanische Dampfschifffahrts-Gesellschaft KG (HSDG) by Maersk Line A/S, while in freight rail transportation it was the merger by BLS AG and Transport Ferroviaire Holding SAS (a subsidiary of SNCF Mobilités). In the digital world, approvals were granted to the joint acquisition by SwissPost AG and the Swiss Federal Railways (SBB) of SwissSign AG, identity and certification services provider, and to Tech Data Corporation for its acquisition of the Avnet Technology Solutions business division from Avnet Inc. If the turnover thresholds are reached by the undertakings concerned or if the concentration involves a company holding an established dominant position (see Section I, above), the filing of a merger notification is mandatory prior to the completion of the transaction. Under Swiss law, there are no deadlines for filing. A transaction can be notified prior to the signing of the final agreements. However, the parties must demonstrate a good faith intention to enter into a binding agreement and to complete the transaction (in practice, the standard is similar to that of the European Commission). The Secretariat of the Competition Commission can be contacted on an informal basis before the notification. This can speed up the notification procedure (for example, the Secretariat can agree to waive some legal requirements in relation to the content of the notification). In the case of mergers, the notification must be made jointly by the merging undertakings. If the transaction is an acquisition of control, the undertaking acquiring control is responsible for the filing. The filing fee for a Phase I investigation is a lump sum of 5,000 Swiss francs (but the Secretariat of the Competition Commission announced in 2015 that if the assessment of incomplete draft notifications involves a large amount of work, in future the Secretariat would invoice this work as chargeable advisory activity). In Phase II investigations, the Secretariat of the Competition Commission charges an hourly rate of 100 to 400 Swiss francs. Once the notification form has been filed, if the Competition Commission considers that the filing was complete on the date of the filing, it will conduct a preliminary investigation and will have to decide within one month whether there is a need to open an in-depth investigation (Phase I). If the Competition Commission decides to launch an in-depth investigation (Phase II), it will have to complete it within four months. As regards the internal organisation, under its internal rules of procedure (revised on 15 June 2015) the Competition Commission has created a Chamber for merger control, which has been granted the power to decide whether a detailed examination (Phase II) should be started and whether the merger can be implemented ahead of the normal schedule. However, the Competition Commission retains a certain residual power in the preliminary assessment, in that it will be informed of the Chamber's decision and may conduct an examination independent of the Chamber (and, as the case may be, overrule the Chamber's decision). The Commission can also delegate other tasks to the Chamber if practical considerations indicate that this is appropriate. Pursuant to the new internal rules of procedure (in force since 1 November 2015), Andreas Heinemann (President), Armin Schmutzler and Danièle Wüthrich-Meyer (both Vice-Presidents of the Competition Commission) have been appointed as members of the Chamber for merger control (effective as of the beginning of 2018). whether the transaction can be unwound must be assessed in the event that the concentration is not allowed by the Competition Commission after its review. In that case, these conditions were fulfilled. However, the Competition Commission imposed two additional conditions: the obligation not to exercise the voting rights except to conserve the full value of the investment, and the obligation to submit a full notification within a relatively short period of time. In practice, the one-month period for the Phase I investigation can be shortened in less complex filings, especially if a draft filing was submitted to the Competition Commission for review prior to the formal notification. If the Competition Commission decides to launch a Phase II investigation, it will publish this decision. It will then send questionnaires to the parties, as well as their competitors, suppliers and clients. Usually, a Phase II hearing with the parties takes place. If the parties propose remedies, close contact is established between the Secretariat of the Competition Commission and the undertakings involved to determine the scope. Ultimately, however, the authority to impose remedies lies with the Competition Commission, which enjoys a wide power of discretion (subject to compliance with the principle of proportionality). Third parties have no formal procedural rights at any point in the procedure. If the Competition Commission opens a Phase II procedure, it will publish basic information about the concentration and allow third parties to state their position in writing within a certain deadline. The Competition Commission is not bound by third-party opinions, or by answers to questionnaires. Third parties have no access to documents and no right to be heard. Moreover, the Swiss Supreme Court has held that third parties are not entitled to any remedy against a decision of the Competition Commission to permit or prohibit a concentration. A decision of the competition authority may be appealed within 30 days to the Federal Administrative Tribunal and ultimately to the Swiss Supreme Court. The duration of an appeal procedure varies, but may well exceed one year at each stage. On 28 February 2018, the Secretariat of the Competition Commission published an updated version of its communication dated 25 March 2009 on the notification and assessment practice regarding merger control (Merger Control Communication). The Merger Control Communication first clarifies the concept of 'effect' in the Swiss market in the case of a joint venture. Article 2 of the ACart provides that the Act 'applies to practices that have an effect in Switzerland'. Until the Merger Control Communication, the Competition Commission and the Swiss courts held that if the turnover thresholds of Article 9 ACart were reached, it should always be considered that there was an effect in the Swiss market. Thus, in the case of the creation of a joint venture with no activity in Switzerland but where the turnover thresholds were met by the parent companies, a notification was required (see, e.g., the Merial decision of the Swiss Supreme Court of 24 April 2001). However, in the Merger Control Communication, the Competition Commission takes a different approach: if the joint venture is not active in Switzerland (no activity or turnover in Switzerland – in particular no deliveries in Switzerland) and does not plan to be active in Switzerland in the future, then the creation of this joint venture does not have any effect in Switzerland and accordingly no notification is required, even if the turnover thresholds are met by the parent companies. In the Axel Springer/Ringier case (dated May 2010), Ringier AG and Axel Springer AG formed a joint venture in Switzerland, in which they concentrated all the printed and electronic media activities they had in eastern European countries. In light of the criteria set out in the Merger Control Communication, the Competition Commission took the view that the joint venture was subject to Swiss merger control, since some of the entities concentrated in it had achieved a turnover in Switzerland in the year preceding the concentration, while others had made deliveries in Switzerland. a maximum transition period of one year. Until that decision, the Competition Commission considered that a transition period of up to three years was acceptable to analyse a case as a single concentration. However, to align its practice with that of the European Commission in its Jurisdictional Notice of 10 July 2007, the Competition Commission decided to reduce the transition period to one year. On a related topic, the Secretariat of the Competition Commission provided in an informal consultation dated 2017 a clarification in relation to a series of transactions according to which the first transaction would lead to the sole acquisition of a target company by one undertaking and a second transaction to the acquisition of joint control over the same target by several undertakings (including the undertaking that acquired sole control in the first place). The Secretariat of the Competition Commission held that only the second transaction would trigger a duty to notify, provided the various transactions are dependent on each other and together form a single operation. The Merger Control Communication also addresses the subject of the geographic allocation of turnovers. In general, the test for the geographic allocation of the turnover is the contractual delivery place of a product (place of performance) and the place where the competition with other alternative suppliers takes place respectively. The billing address is not relevant. Special rules apply to the calculation of turnovers based on the provision of services. The Merger Control Communication also clarifies the examination criteria and the notification requirements for markets affected by concentrations in which only one of the participants operates, but has a market share of 30 per cent or more. The issue is the extent to which the other companies involved in the concentration may be categorised as potential competitors. According to the Competition Commission's practice, a planned takeover leads to the exclusion of potential competitors if an undertaking involved plans to enter the problematic market or if it has pursued this objective in the past two years (e.g., the development of competing medicines that has entered an advanced phase may be interpreted as the intention to enter a new market). An exclusion of potential competitors is also possible if an undertaking involved holds important intellectual property rights in this market, even where it is not active in the market concerned. Special attention must be given to cases in which another undertaking involved is already active in the same product, but not geographic market or in an upstream, downstream or neighbouring market closely linked with the market in which the relevant undertaking holds a market share of at least 30 per cent. The Competition Commission maintains close links with the European Commission. It accepts that, in cases where a notification has also been filed with the European Commission, the parties provide the Form CO filing, annexed to the Swiss notification for reference. This reduces the workload for the drafting of the Swiss notification, as the parties therefore only have to add specific data regarding the Swiss market. That said, while annexes to the Swiss notification may be provided in English, the main part of the notification must be drafted in one of the Swiss official languages (French, German or Italian). The Competition Commission aims to give a decision coherent with that of the European Commission if a case has been notified both in Brussels and in Bern. To ensure compatible decision-making, it is advisable for the parties to provide a waiver that allows the Competition Commission to liaise directly with the European Commission. More generally, the report of the Taskforce Cartel Act presented in January 2009 (see Section V, below) states that in the context of growing globalisation, it would be appropriate for Switzerland to conclude cooperation agreements with its main trading partners to make possible the exchange of confidential information between competition authorities. On 17 May 2013, the government signed an agreement between the Swiss Confederation and the European Union concerning cooperation on the application of their competition laws (Agreement). In essence, the Agreement regulates cooperation between the Swiss and European competition authorities. It is a purely procedural agreement and does not provide for any substantive harmonisation of competition laws. The two competition authorities shall notify each other in writing of enforcement activities that could affect the important interests of the other contracting party. A list is given of examples of cases in which notification must be given, and the time for notifications in relation to mergers and other cases is also set out (Article 3, Paragraphs 3 and 4). Furthermore, the Agreement creates the legal basis for the competition authorities to be able to coordinate their enforcement activities with regard to related matters. The Agreement entered into force on 1 December 2014. The Competition Act does not contain any specific rules regarding public takeover bids. The Competition Commission should be contacted in advance so that it can coordinate its course of action with the Swiss Takeover Board. This is particularly important for hostile bids. Past practice has shown that in most cases the Competition Commission substantially follows the rules of the EU Merger Control Regulation on public takeover bids. In addition, it is possible to request provisional completion specifically in public takeover bids (see Section III, above). On 14 January 2009, the federal government was presented with a synthesis report issued by the Taskforce Cartel Act, a panel formed in 2006/2007 by the head of the Federal Department of Economic Affairs to evaluate the ongoing effects and functioning of the ACart. Article 59a of the ACart requires the federal government to evaluate the efficiency and conformity of any proposed measure under the Act before submitting a report and recommendation to Parliament in relation to such measure. As regards concentrations, the Taskforce Cartel Act took the view that, compared with other countries, the Swiss system, which only prohibits concentrations that can eliminate effective competition ('dominance-plus test'), is deficient and provides a relatively weak arsenal to enhance competition effectively. According to the experts, a risk exists that concentrations adversely impacting competition might be approved. They recommended a harmonisation of the Swiss merger control system with the EU merger control system to eliminate that risk and to reduce the administrative workload with respect to transnational concentrations, as well as the implementation of modern instruments to control the criteria governing intervention in the case of concentrations (the SIEC test, efficiency defence and dynamic consumer welfare standard). On 30 June 2010, the federal government published a set of draft amendments to the ACart for public consultation. The government proposed, inter alia, to replace the currently applied 'dominance-plus test' either with a simple dominance test (whereby the criterion of a possible elimination of competition would be dropped) or with a significant impediment to effective competition (SIEC) test analogous to EU law. As regards notification obligations, the government proposed maintaining the existing turnover thresholds, but suggested a new exception to eliminate duplicate proceedings where every relevant market geographically extends over Switzerland plus at least the European Economic Area and the concentration is being appraised by the European Commission. Based on the results of the consultation procedure, on 22 February 2012 the federal government released a dispatch to Parliament on the revision of the ACart together with a set of draft amendments. Regarding merger control, the draft amendments confirmed the willingness of the federal government to change the assessment criteria for the merger control procedure (introduction of the SIEC test) combined with a relaxation of regulations on undertakings in the case of concentrations with defined international markets and in relation to deadlines (harmonisation with conditions in the EU). Additional changes in the merger regime included more flexible review periods. The present review periods in Switzerland are one month for Phase I and an additional four months for Phase II (see Section III, above). The reform would have introduced the possibility to extend the review period in Phase I by 21 days and in Phase II by two months. Such extension would have to be agreed between the authorities and the undertakings concerned. Finally, the reform would have included a waiver of the notification obligation in the case of a concentration where all relevant geographic markets would comprise at least the EEA plus Switzerland and the concentration is assessed by the European Commission. In such cases, the filing of a copy of Form CE with the Swiss authorities for information purposes but without review would have been sufficient. In the parliamentary debate, the Council of States approved the Federal Council draft for the revision of the Cartel Act at its first reading in March 2013, subject to various amendments. However, the National Council at its first reading in March 2014 decided not to consider the revision. After the Council of States adhered to its decision in June 2014, but the National Council again decided not to consider the revision in its second reading in September 2014, the final outcome was that the Cartel Act would not be revised. According to the Competition Commission, rejection of the revised Cartel Act without even considering it was a missed opportunity to meet the need for reform highlighted in the evaluation. It also means that several changes proposed by the Council of States, including changes to the merger control procedure, are no longer on the table. In the course of 2014, 2015 and 2016, individual parliamentary proposals were submitted with the aim of revising specific points in the Cartel Act. Based on its report on preventing parallel imports dated 22 June 2016, the Federal Council instructed the Federal Department of Economic Affairs, Education and Research to prepare a consultation bill on modernising the merger control procedures in the Cartel Act. The Federal Council takes the view that the current merger control procedures take too little account of the negative and positive effects of mergers, and that the test for market dominance currently provided for in the Cartel Act could be replaced by the SIEC test. The Federal Council expects this possible change to have positive effects in the medium to long term on the competitive environment in Switzerland. The State Secretariat for Economic Affairs has overall responsibility for drafting the bill to be submitted for consultation; it commissioned a report on the implications of the introduction of the SIEC test on the Swiss control regime, which was released on 27 October 2017 and which, among other conclusions, recommends that such test be introduced. Also, the Buman Parliamentary Initiative of 30 September 2016 demands that four specific undisputed points in the rejected revision of 2014 be reintroduced, namely the merger control procedure for companies. The initiative has not yet been debated in Parliament. 1 Pascal G Favre and Marquard Christen are partners at CMS von Erlach Poncet Ltd.